We hear a lot about “big business,” but small business is actually much more common. In fact, small businesses—those with 100 employees or fewer—make up around 48% of the private workforce in the United States. The small business landscape includes businesses of all kinds, including health care facilities, restaurants and food service, retail, manufacturing, technical and professional services, construction, worship centers and other non-profits, rental and leasing companies. The list goes on and on. Small businesses often run on tight margins, and their owners may find themselves in serious trouble if something were to happen to the equipment, supplies, facilities, or other assets—not to mention employees—that they rely on every day. However, many small-business owners may think that their businesses are too small to benefit from commercial security systems or premise access controls, when in fact access control systems and other security features can affordably cover businesses with only eight doors—or even fewer—giving the owners of even the smallest businesses peace of mind. Can your small business benefit from commercial access control? The answer is almost certainly yes. But many small-business owners incorrectly believe that access control systems aren’t available for smaller applications and configurations or that access control isn’t affordable at their scale. Neither of these beliefs are correct. Before you can understand how commercial access controls will benefit your small business, however, you have to really understand what access control is and how it works. 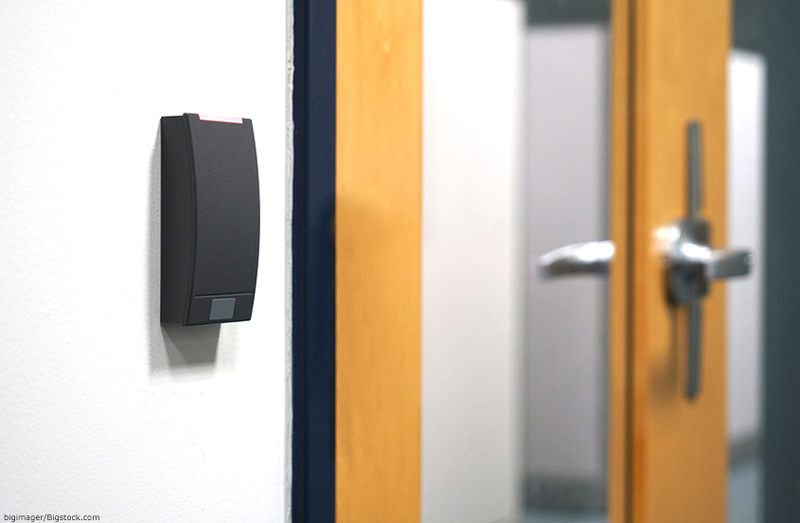 More than just alarms or locks, access controls combine hardware and software that work together to control access to any entry points in your building—large or small. At their most basic, access controls grant (or deny) access to individuals for specific areas of the building. This may be the front or back door, but it can also be doors to money rooms or secured storage rooms within the building. A small healthcare facility, for example, might have drugs and other valuable or controlled substances stored on the premises and allow only certain employees to access them, while a restaurant might allow suppliers to access the loading docks after hours. Access control technology is simple and can be readily employed by businesses of any size. The Access Control Panel. This is the brains of the operation, serving as a central nexus for all the control readers, door hardware, and so on. Access Control Readers which detect credentials such as key cards or act as keypads. Credentials, such as key fobs or access cards, that allow employees (or others) access to the premises. Door Hardware installed on every door that unlocks (or locks) the doors when access is granted (or denied). Management Applications that allow you to set up and manage users, permissions, and schedules. You’ll also get instant alerts, real-time updates, mobile access, cloud backups and more. Why does your business need access control? At its heart, access control may be about restricting unauthorized access to your facilities, supplies, and systems, but access controls do much more than that, too. As a key component of commercial security systems, access controls can not only help prevent unauthorized people from getting in, they can tell you who is where and when, giving you vital data that you can leverage to help you do your job. At this time, we’re recommending ProdataKey (PDK) products to our business clients both large and small. PDK is leading the pack when it comes to access control technology and software, making it easy—and affordable—for small businesses to implement and run commercial security technology. The PDK Eight io comes with a standard configuration for one to eight doors, making it perfect for small-business security right out of the box. Configured for either ethernet or wireless, each PDK Eight io is equipped with a power circuit that monitors everything from input to battery voltage, giving you immediate alerts if any hardware issues arise. We offer a complete lineup of PDK network, point of entry, and wireless door controllers, giving you access control wherever you need it. You can also pick up single-door controllers if you have just one door to monitor or if you need to expand your system beyond the initial configuration as your business grows. Commercial security cameras are not just for larger businesses. Businesses of all sizes can benefit from commercial security cameras, which help keep an eye on premises, inventory, money, and more, while also providing a record in case of adverse events. Advances in wireless security camera technology have led to cameras that are smaller, easier to use, and more affordable than ever before, and businesses of all sizes are taking advantage. Access controls and security cameras help you keep an eye on your business—but then who’s keeping an eye on it when you can’t? That’s where reliable, 24/7 monitoring services come in. When your commercial security system sends an alert, you may be asleep or in a meeting, but with 24/7 monitoring, anytime something happens at your business, day or night, you have the peace of mind that comes with knowing there’s someone ready to respond. From access controls and security cameras to remote monitoring and apps that put your security literally in the palm of your hand, commercial security for small business has never been easier to install or manage than it is today. What’s more, commercial security elements such as full-featured access control are available and affordable for businesses of all sizes, even if you only have a small retail space with just a few doors to manage. A-TEC Commercial Security in Kansas City is certified in the latest access control technologies from ProdataKey, and we’re proud to install them in businesses of all sizes all over the metro area. We also offer security cameras, 24/7 monitoring, and all the other commercial security solutions that your business needs. For more information or to get started protecting your business, contact A-TEC Security today.